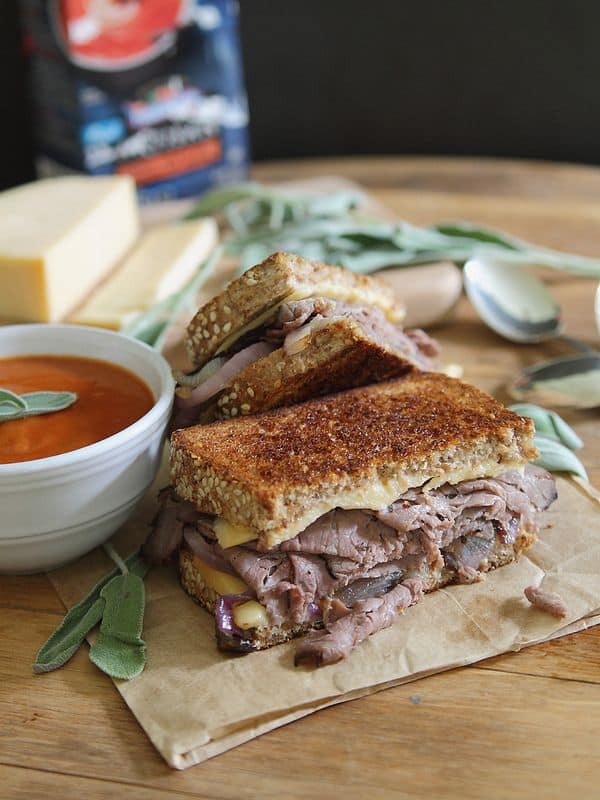 This roast beef smoked gouda grilled cheese is the perfect sandwich to go with a nice hot bowl of soup! Thank you to @ProgressoArtisan for sponsoring this post. In case you hadn’t noticed, I don’t let go of summer and head into fall very willingly each year. There’s a lot of kicking, screaming and whining that goes down as I channel my inner 3 year old having a temper tantrum in the middle of a store. September makes me batty as everyone gets all “pumpkin! cider! boots! scarves!” crazy when it’s clearly still 80 something degrees outside and not a single leaf has changed color yet. But come October, the cooler temps and the leaves that cover every square inch of our yard, I give in. I’ll happily shove an apple cider donut in my face every weekend from the local apple orchard, break out the boots, give into the pumpkin craze, cozy up with a cup of tea in the afternoon and start to embrace soups again for lunch in an attempt to stay warm and come out on top in my battle against turning on the heat in the house. Salads are my summer time lunch meal when there’s nothing else easily accessible in the house and soup is my winter one. Finding a decent soup is challenge #1. Yeah, yeah, making my own is great, but that’s just not realistic every week. Figuring out what to pair with that soup is challenge #2. Luckily, I got you covered on both fronts today. There’s something about a classic creamy tomato soup that just beats out all the other soup choices for me. A good one is fresh tasting like vine ripe tomatoes, doesn’t leave you with that “canned tomato” taste in your mouth and is the perfect accompaniment to a grilled cheese sandwich. So paired with Progresso®’s brand new Creamy Tomato with Roasted Red Pepper (which is all those things! 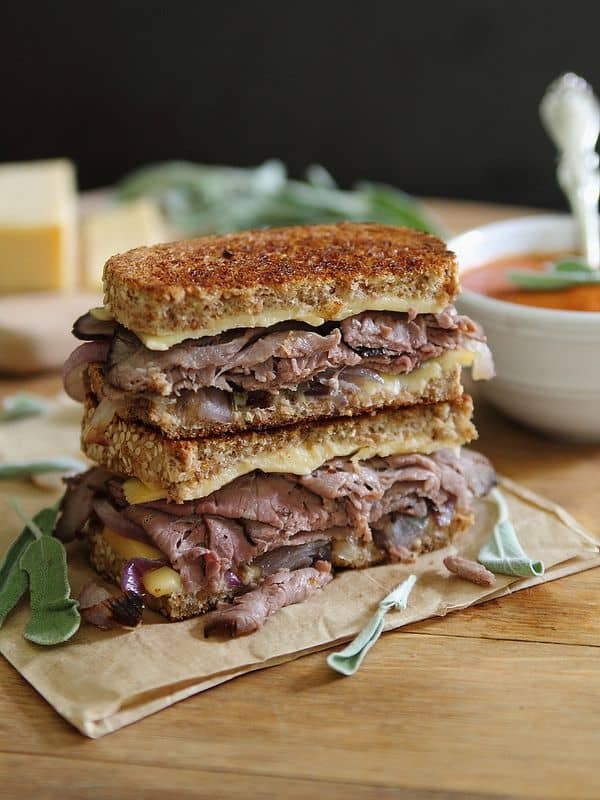 ), I decided to do a hearty grilled cheese filled with roast beef, smoked gouda cheese and sage caramelized onions. Caramelizing the onions is a little bit of extra work for a grilled cheese but I promise you won’t regret it. 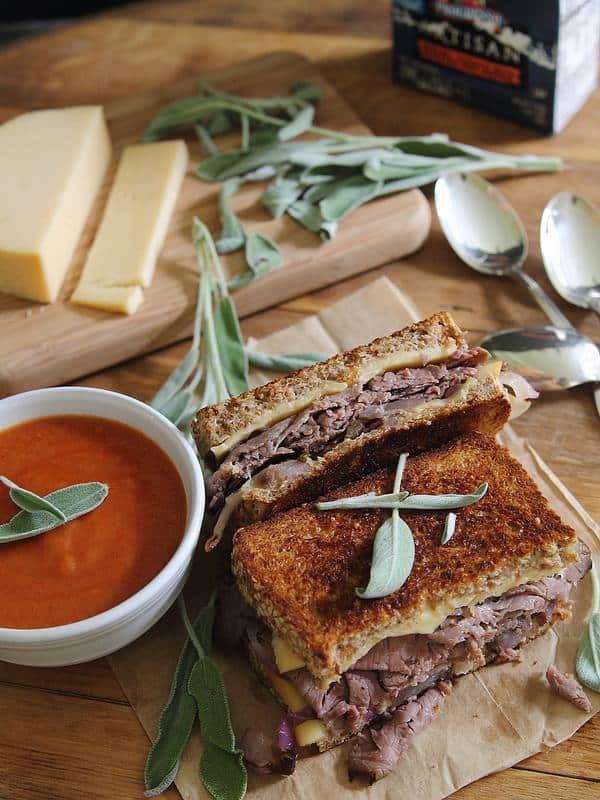 It’s a tough call between the savory sage onions and the melted creamy smoked gouda on which is the best part of the sandwich but no matter how you eat it; soup first/sandwich last, dunking the sandwich into the soup or the one bite sandwich/one slurp soup approach, you’re going to love this combo! It’s classic, hearty, warming and perfect as we head into the cold afternoons of fall. Melt 1 tablespoon of the butter in a large skillet over medium heat. Once the butter is melted, add the onions and sage. Toss to coat all the onions in the butter, reduce the heat to medium-low and let the onions saute slowly for 30 minutes, only stirring very occasionally. After 30 minutes they should be nice and caramelized. Use the remaining tablespoon of butter to spread on one side of each slice of bread. With the buttered side facing down, layer half the cheese slices on top of the bread. Next lay the roast beef on top of the cheese. Spoon some of the onions (you may have extra) on top of the roast beef. Top the onions with the remaining cheese and then the other slice of bread with the buttered side facing up. Transfer the sandwich to a skillet over medium heat. 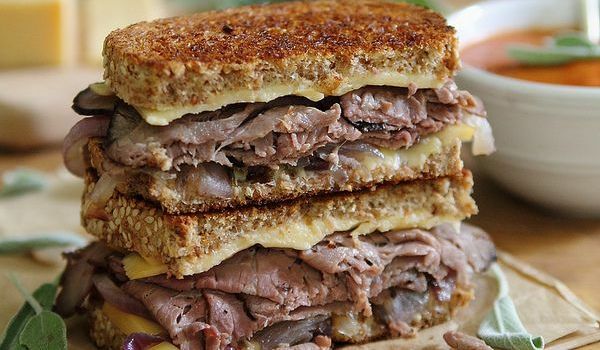 Press the sandwich down using a large spatula and hold pressure on it so that the cheese melts. After about 2 minutes, flip the sandwich over and repeat. The first side should be a nice golden brown. Alternatively, you could use a panini press for this if you have one. Once the other side is golden brown and the cheese is melted, remove from the skillet, cut in half and serve up with your bowl of soup! Thank you and Technorati Media for being sponsors of this article. All opinions expressed here are my own. This looks amazing! I want to try it! I want to unlock my jaw and shovel this sammie in. Pinned! This looks amazing! Pretty sure my boyfriend would love this. It’s going on my list! Woah!!! Come to mama! I need this for lunch. Woah, that smoked gouda sounds great! I bet it adds a nice flavor to the sandwich. Yum! This made me think of those old Tex Avery cartoons where the animal/characters jaw drops to the floor when a pretty “thing”…animal passes by…It is that reaction provoking!! I ALWAYS consult YOUR blog when searching for a meal that will create similar responses at the family dinner table….My tribe will FREAK over this particular offering…Thanks for the extremely helpful caramelized onion tutorial as well…the stellar images and “talk-through”…AND your witty writing….love it ALL! That bread looks great too. What bread was used in this recipe? That looks amazing!!! I pinned this for later, but I have to remember not to look at this when I’m hungry. This sandwich is calling my name it looks amazing! This looks so yummy will be making!! Oh man, you have me craving a creamy bowl of tomato soup and this grilled cheese now :) Glad you enjoyed it for dinner!